With equities soaring for a second day, the VIX was naturally still on the slide, settling lower by a very significant -13.5% @ 16.81. Near term outlook offers continued cooling into year end... and beyond. VIX 11s, or even the 10s appear viable by mid/late January 2015. VIX is clearly in a new multi-week down cycle. Typically... it will take a few weeks to make a floor, and then another 4-6 weeks of minor chop until the next 'brief spike'. 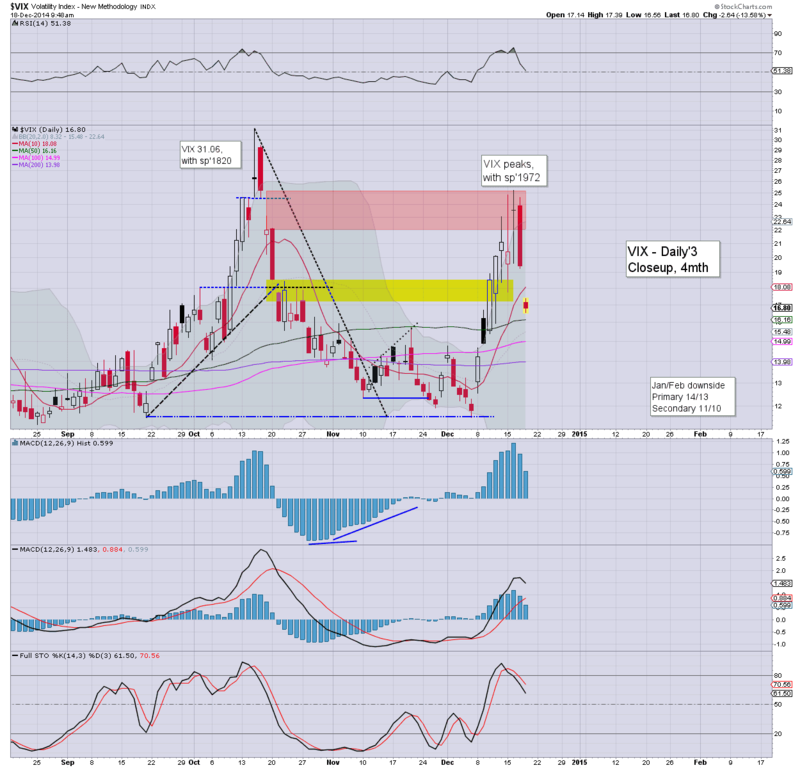 VIX 20s look off the menu until at least late Jan/early Feb. US equities saw a second consecutive day of powerful gains, sp +48pts @ 2061. The two leaders - Trans/R2K, settled higher by 1.6% and 1.5% respectively. 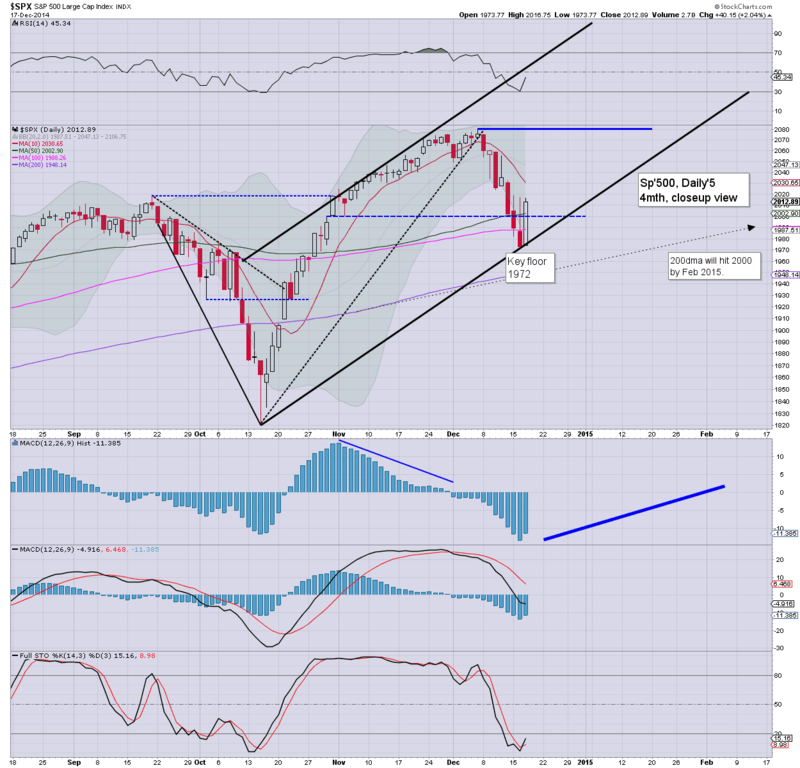 Near term outlook is for continued gains into early 2015... to the sp'2100s. *frankly, the closing hour was hillarious... and utter obliteration to those still touting 'its just a bounce'. Yesterday was a clear turn... and today offered the bull maniacs the follow through they needed for confirmation. We're headed higher.. to the sp'2100s. There remains small chance of that before year end, but regardless of when... the 2100s are coming. Regardless of the exact daily close, today is day'2 of what will be a very significant up wave into early 2015. Any weekly close above 2042 would make for a clear net weekly gain of around 2%. Oil has fallen significantly, but is holding the recent low. Metals remain highly vulnerable, but for today, Gold +$5. 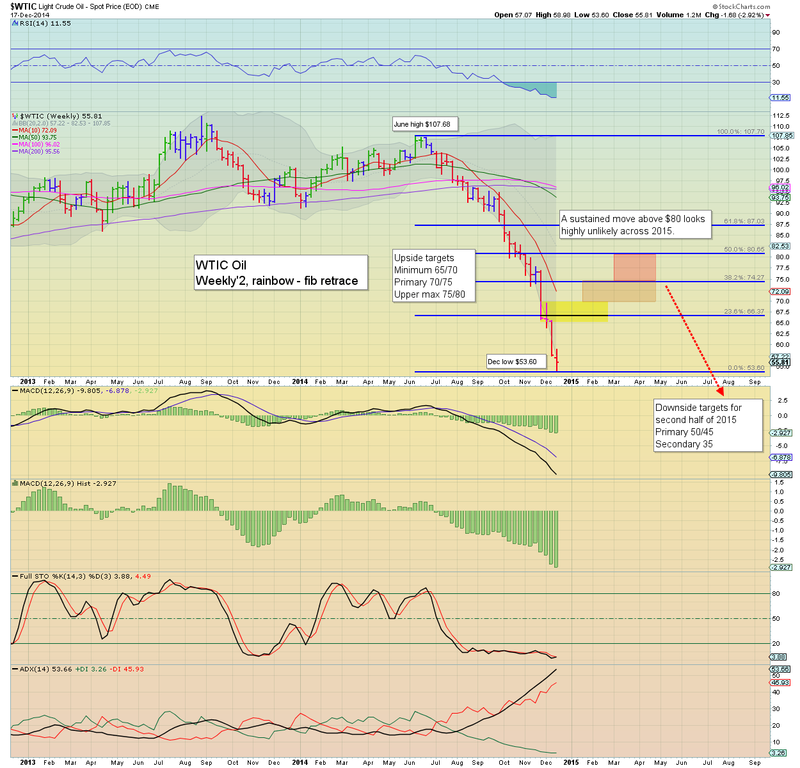 *price action in the Oil is very dynamic, with a fractional higher low... arguably.. a double floor. A daily close back >21 would highly support such a notion. So.. a second day of hugely significant equity gains. As ever.. there are little down cycles along way, but... the underlying upside remains very powerful. Suffice to say... up up up... today being day'2. Anyone calling this a bounce... needs to... well.... I'm sure you can guess a few of my 'suggestions'. US equities have seen a minor pull back from the earlier high of sp'2046, but there remains huge underlying strength.. having already ramped 74pts from the Tuesday close of 1972. VIX remains in cooling mode, -8% in the 17s. Oil remains weak, but above what is still very likely a key floor of $53. 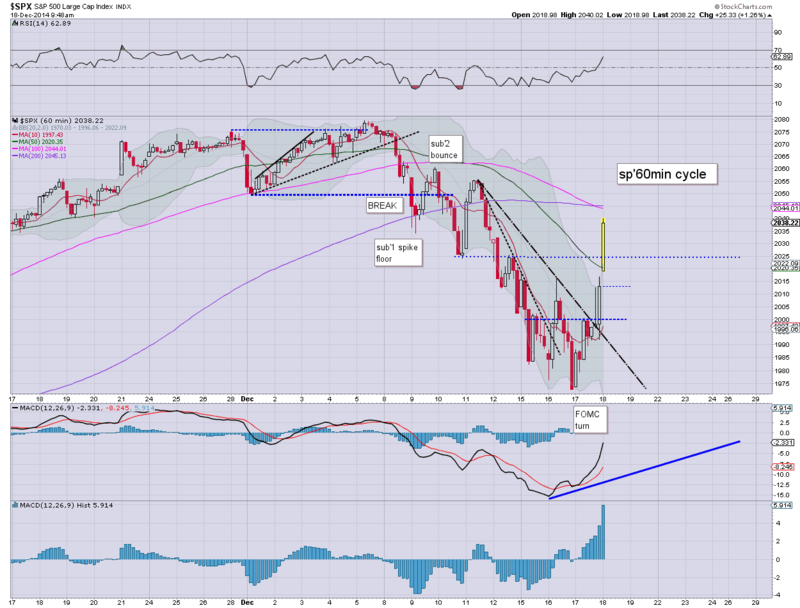 *yes, the R2K has a black-fail candle on the daily chart right now, but on this occasion, I am dismissing it. There remains a lot of bizarro talk out there, such 'ohh, its just a brief 2-3 rally.. before new lows into January'. 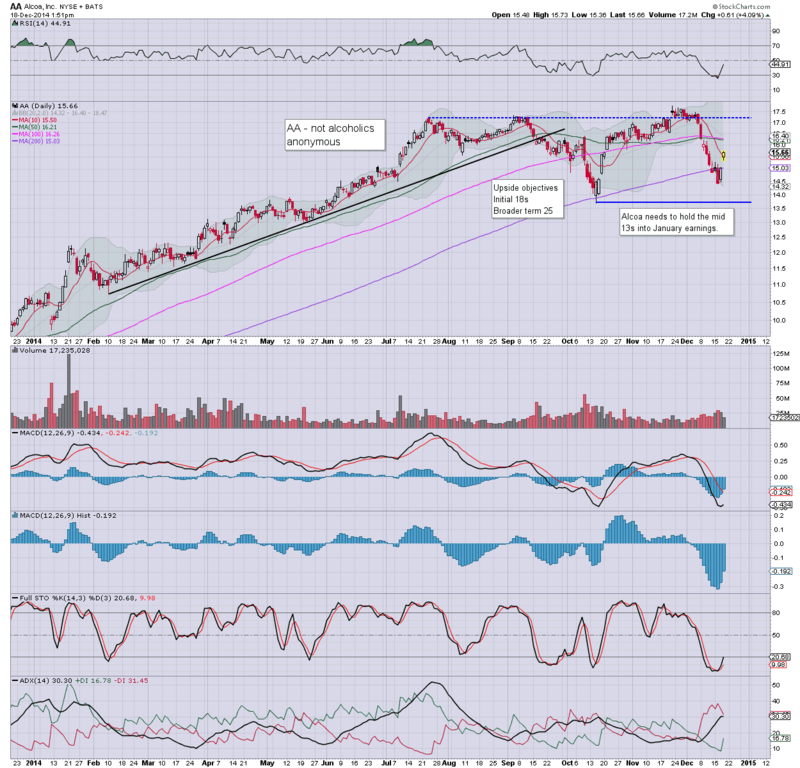 The R2K is going to get a daily close in the 1190s.. whether today.. tomorrow.. or in Christmas week. From there.. a move to new historic highs >1213 seems likely in January. 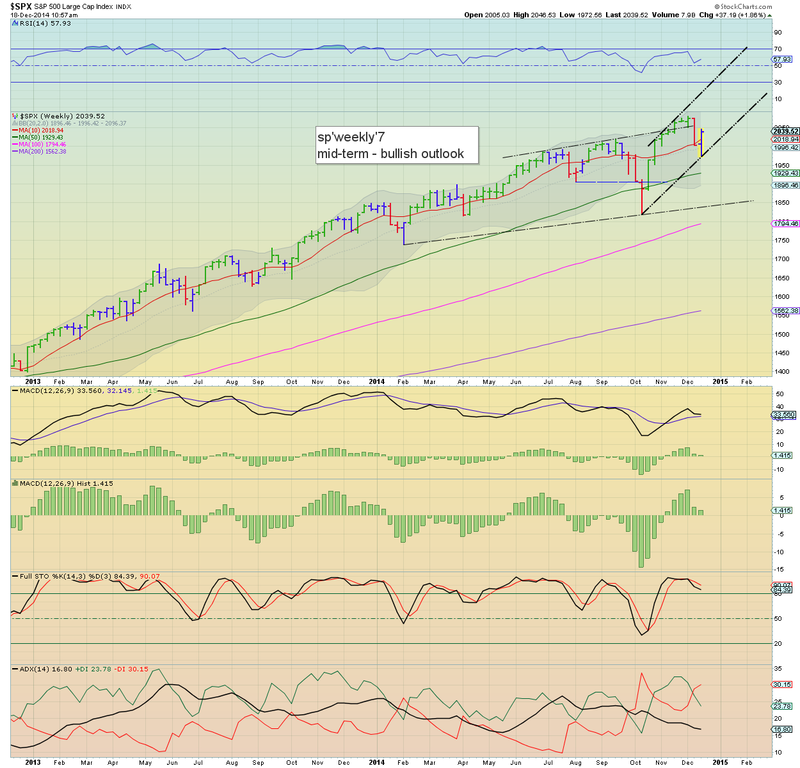 A monthly close in the 1220s.. will clarify that the broader market is going to climb far.. far higher across 2015. No doubt a few will be getting overly excited about a move from 2046 to 2039.. but really... there is total clarity on where we are headed. laughable highlight of the morning.. the Cramer on clown finance TV 'I wouldn't chase it' (from sp'2030s) Well.. maybe he'll start to get bullish again in the 2100s next month? 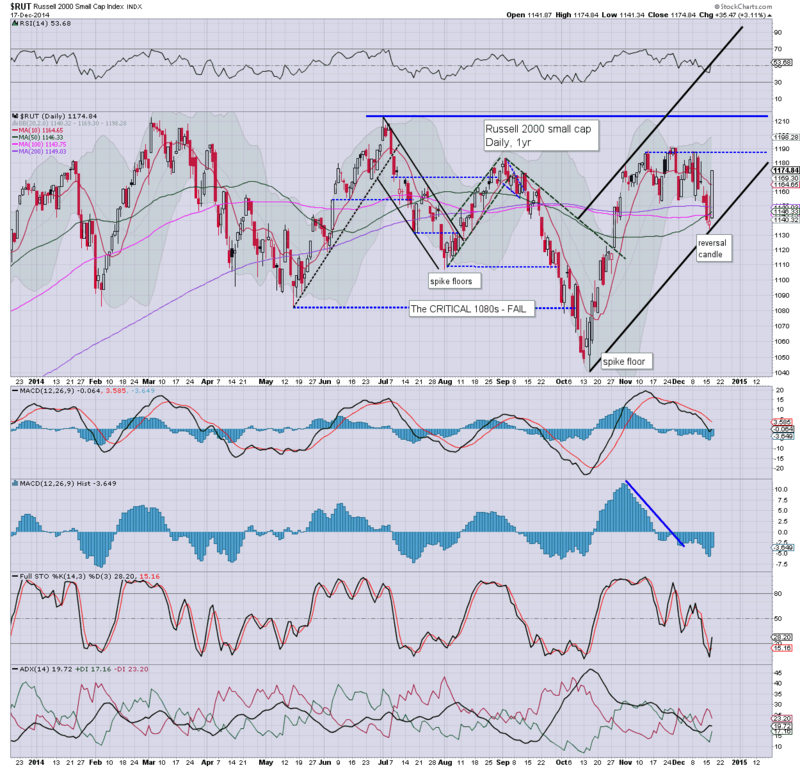 US equities are seeing huge follow through, with the sp' already breaking into the 2040s. VIX is naturally on the slide, -14%, in the 16s. Oil is battling to push into the $60s... +1.1%. Metals are holding sig' gains, Gold +$14.... but overall price structure remains bearish. Suffice to say.... bears had plenty of opportunity to exit across Fri-Tuesday. If I see any whining or 'surprise' at the gains, I won't have much tolerance with any such person. Huge gains... but more so.... huge buying, especially in energy. I'm almost tempted to see what those maniacs on the cesspool that is Zerohedge have to say about today. No doubt... its just the same old crap. So... a very strong opening is due... and as I noted yesterday, there is no doubt... there is clarity. We're headed to the sp'2100s... and probably... far beyond this spring. There can be NO excuses for any whining or complaints from the equity bears... there were plenty of warnings... not least from yours truly. 8.58am sp +28pts.... 2040. That makes for a clear 3.5% gain from the Tuesday close... we'll pushing higher.. and it ain't gonna stop. Notable gains, ERX +7% in the low $59s.... XIV +5% in the $33s. SPXL +4% , $85s. 9.08 Oil cooling a little, but still +1.7%. The $60 threshold will give full clarity of a short term floor. 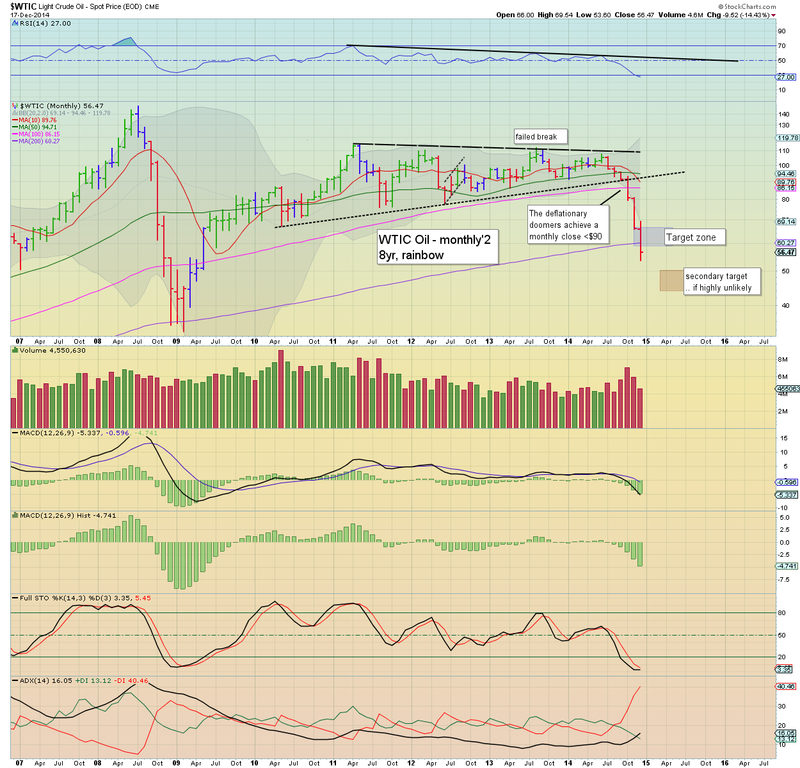 A year end close in the low 60s looks likely. It was a pretty wild day in the oil market, with WTIC Oil swinging from an early low of $54.21 to an intra high of $58.98. However, there was renewed weakness across the afternoon, with Oil settling +1.7% @ $56.47. 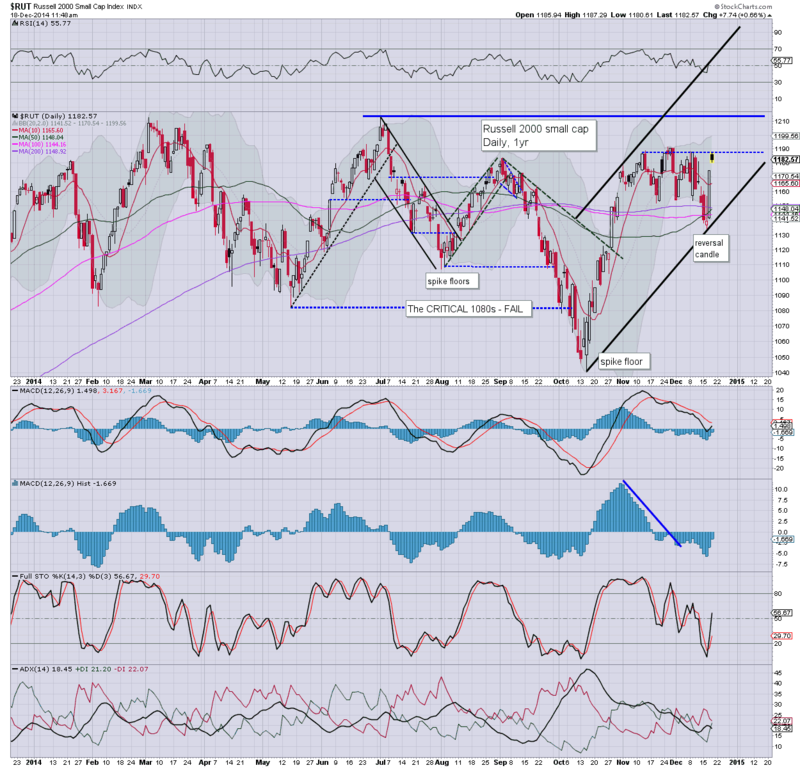 Mid term outlook is for a rally to the low $70s by late spring. Clearly, there is no decisive turn on the bigger weekly/monthly cycles, but the daily Oil charts are offering a provisional turn. 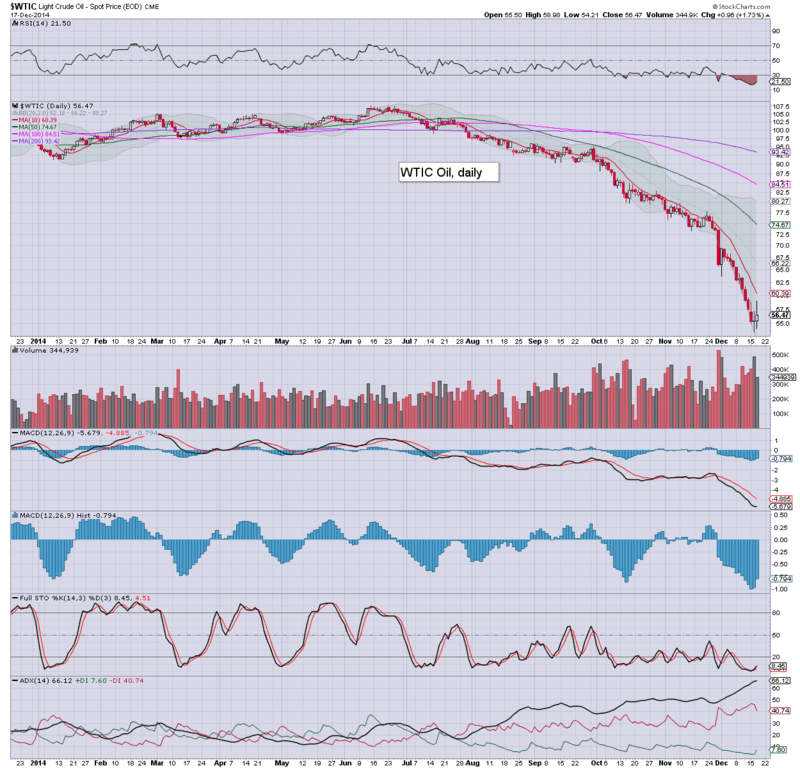 If Oil has floored at $53.60, first upside are the low $70s.... which of course is a long way up! A $17/22 bounce is VERY viable.. and would make for a natural retrace across the next 2-4 months. From there, I am currently of the view that Oil will fall from the 70s...to break new multi-year lows in the 40s... perhaps 30s in the second half of 2015. The problem for the oil bulls is that OPEC are refusing to cut... and after a bounce in early 2015.... the broader downside will likely resume. Oil bulls should be looking for the first blue candle, whether by end year... or in January. That should clarify a sig' bounce to at least 65/70 by early spring. Regardless of that longer term view, we probably do have a floor/turn.. along with the equity market. Thursday has an array of data.. weekly jobs, PMI service sector, leading indicators, phil' fed. If most of those come in at least 'reasonable', it will give the market an excuse to continue climbing into the sp'2020/30s. US equities built very significant gains across the day, sp +40pts @ 2012. The two leaders - Trans/R2K, settled higher by 0.8% and 3.1% respectively. 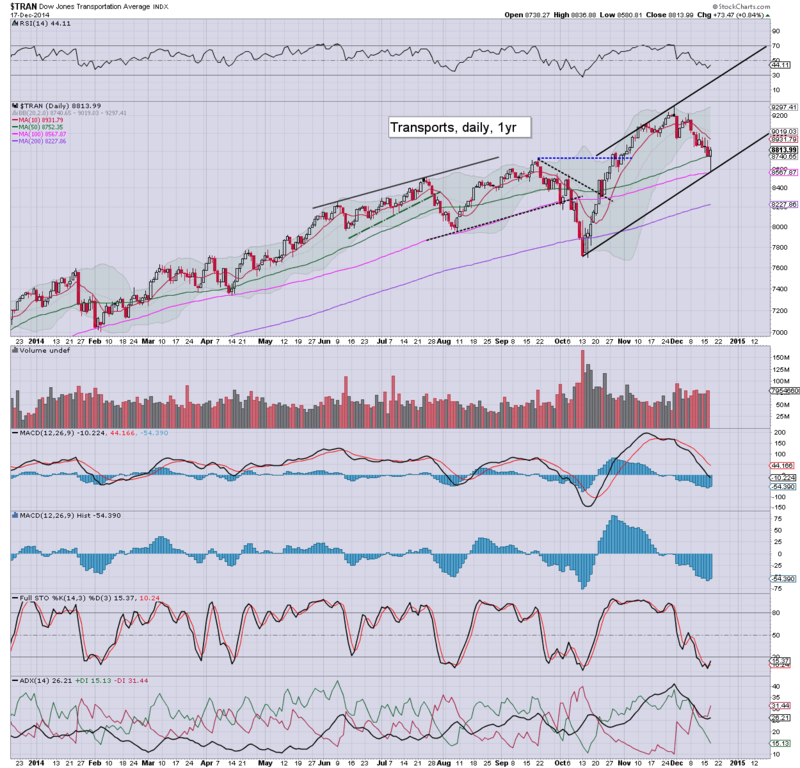 Near term outlook is for a key floor of 1972.. with the 2100s no later than January. Without question... we have a solid floor of sp'1972.. as of the Tuesday close. 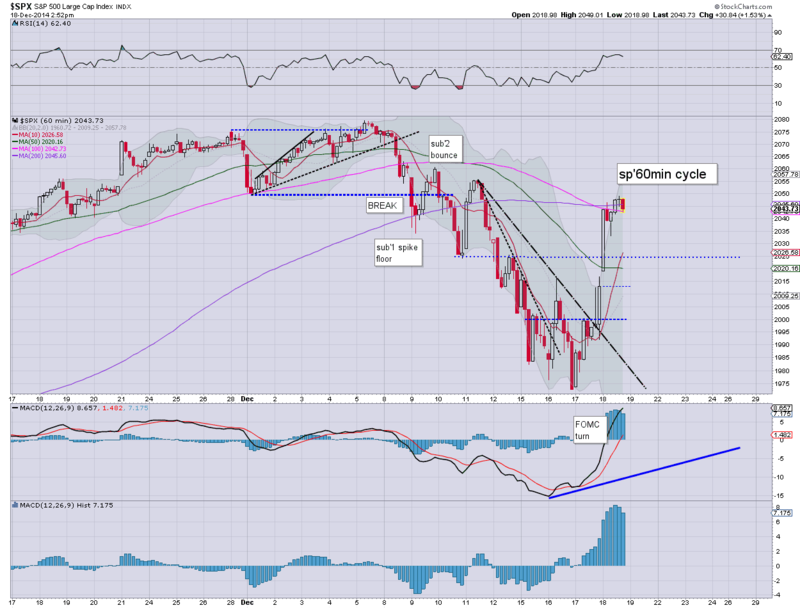 With today's close of 2012... the market is now well on the way to the sp'2100s... if not much higher across spring 2015. 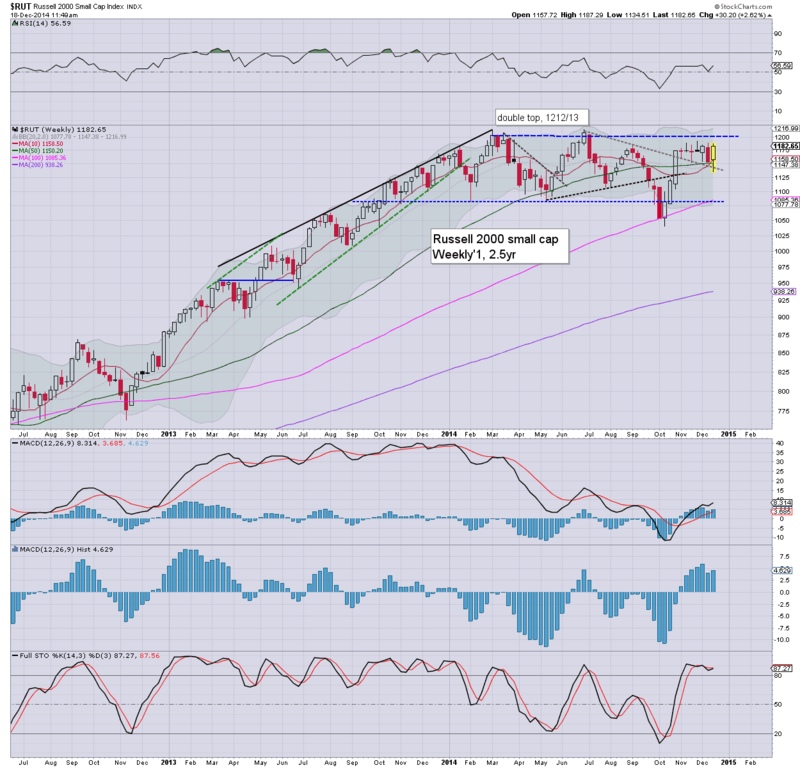 The R2K saw a powerful gain of 3.1% today, and looks set to break new historic highs >1213 in January. Once that is achieved, it will be an extremely powerful signal to the broader market.. and be suggestive of sp'2300s by late spring. 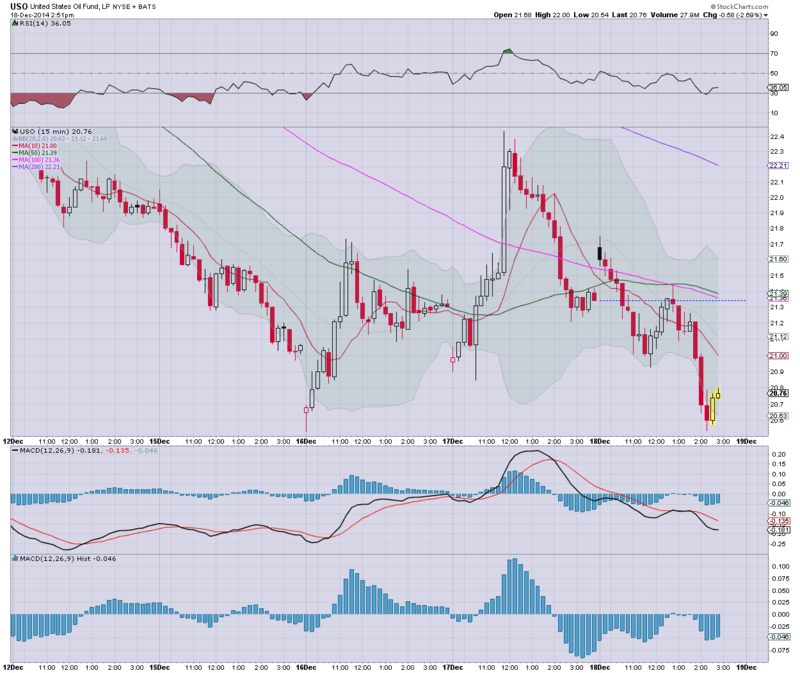 Special note, the R2K is due a 'golden cross' (50dma crossing above 200dma) either tomorrow.. or Friday. The Trans only managed a moderate gain today, but that is no doubt due to the realisation that Oil prices have likely floored at $53.